In our cozy little modern world with all the modern conveniences and appurtenances for entertainment, the world-shocking episode of Mendel Beilis is almost a lost case. Yet, back in the early 1900's, the blatant anti Semitic trial of Mendel Beilis that took place in Kiev, Ukraine, caused an international sensation that showed the extents and roots of anti-Semitism. It is important for us, who live in our times, to really understand this ant-Semitic trial in order that we may learn the lessons of it, that we may apply them to our own modern life. In it, we may understand more of the workings of the anti-Semitic minds and their rationale. The trial concerned a thirteen-year-old boy by the name of Andrey Yushchinsky who left his home to go to school. This was on March 12, 1911. Eight days later his mangled body was discovered in a cave. Later it was determined that Andrey decided to skip school and visit his friend Zhenya Cheberyak. Zhenya's mother, Vera was known in the neighborhood as an associate of criminals and as a "fence" (a seller of stolen property). During preliminary hearings it was revealed that Andrey and Zhenya were seen walking together at a point halfway between the Cheberyak home and the Zaitsev brick factory where Mendel Beilis worked as a clerk. The police investigation, at first, concentrated on Vera Cheberyak and her underworld associates. During the funeral, leaflets were distributed accusing the Jews of the murder and summoning the Christians to avenge the murder. Two Russian organizations, the Union of the Russian People, and the Double-Headed Eagle, which were both national reactionary anti-Semitic groups, continued to clamor for the police to focus on the Jews. Although the murder transpired in 1911, the court trial did not begin until 1913. The trial was in fact a major conspiracy conceived by high officers of the government of Czar Nicholas II. Following a revolution of 1905, Russia was in the grip of a counter-revolution in which the Jews were the major scapegoats and victims. The czarist regime used the blood libel charge as a convenient political weapon to divert the attention of the masses from the corrupt and repressive policies of the government. Blaming the Jews for all of the ill that beset the empire took pressure away from the government. The revolutionary movement was growing in scope and intensity and becoming increasingly unmanageable. The monarchist elements in the government were on the lookout for a new ploy to divert the revolutionary ferment against the czar. Mendel Beilis was thirty-nine years old at the time of the trial. He was an ex-soldier and the father of five children. He was employed as a clerk at the Zaitsev brick factory. Kiev had a Jewish population of approximately twenty thousand Jews out of a total population of four hundred thousand. Although Beilis's father was a pious Jew and hasid, Beilis had little learning. He could recite Hebrew prayers and some knowledge of religious rites. He worked regularly on the Sabbath and the Holy Days, with the exception of Rosh Hashanah and Yom Kippur. 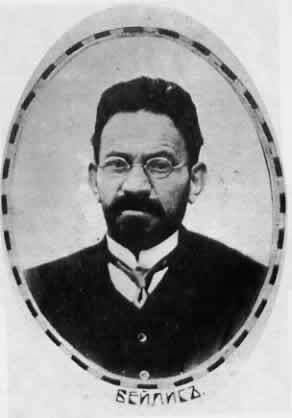 Top Jewish lawyers were appointed in his behalf by the Jewish community to represent Beilis. The prosecution was composed of the government's best lawyers. The trial took place in front of a jury that was devoid of "intellectuals", since the prosecution knew that the "intelligentsia" was opposed to the czar. Of the twelve jurors, seven were member of the notorious Union of the Russian People. Indeed, it was the leadership of the Double-Headed Eagle organization that constantly prodded the police in the direction of the Jews. The Double-Headed Eagle had many connections in various ministries and it was largely due to their influence that the trial turned from investigating Vera Cheberyak and her underworld associates to seeking a Jewish scapegoat. During the trial the presiding justice kept reminding the defense lawyers that the Jewish religion was not on trial merely individual fanatical Jews. The prosecution brought as an expert witness an unknown and obscure Catholic priest who resided in far off Tashkent to act as the religious expert for the prosecution. Although an anti-Semite of the highest caliber, he failed to impress the judges with his flimsy knowledge of Judaism and their rituals. During the trial, the court established that the boy was murdered elsewhere and his body brought to the cave. His head and body had multiple wounds, yet there were no blood stains in the cave. The court established that the wounds were inflicted by two or more persons. It was established that he was truant and instead of going to school he went to visit his friend Zhenya, the son of Vera Cheberyak. Vera told the police that Zhenya, who died of dysentery shortly after the murder, saw a black bearded man chase after Andrey and drag him towards the factory kiln. Zhenya, unfortunately, was dead, and could not substantiate the testimony. At the same time rumors were being spread that the murder was perpetrated for Jewish religious requirements. The police deliberately ignored neighbors who heard the scuffle. Two sisters who entered the Cheberyak flat after the murder revealed suspicious circumstances being that the carpet which was normally on the floor was rolled up like a tube and stuffed under the sofa. In addition, one of Vera's friends revealed that the boy was beaten in the apartment and when his cries were becoming apparent, his mouth was stuffed with pillow case. Yet the police and prosecution ignored the obvious, the boy had to much knowledge of the underground activities of Vera Cheberyak and her underworld associates. When he made his knowledge apparent, he was murdered. They utilized the murder to avert the masses from their reasonable demands that the government be civil and just. Fortunately for Mendel Beilis and the Jews of Russia the jury acquitted Beilis. The jury was split six to six, and under Russian law, that is an acquittal. The acquittal of Beilis was a stunning blow to a cunning and deceitful government. In Russia, the progressive elements, the intelligentsia, the liberal press felt affronted by the spectacle the czarist government staged. The liberal press claimed that from the beginning the authorities knew that Vera Cheberyak and her underworld associates were guilty of the crime. The world at large had followed the Beilis trial. At its conclusion Russia was severely criticized by the Western world for trying to bring back the myth of blood libel to prop up a decedent monarchy. It was antics like the Beilis trial that served the corrupt government to keep it in power. Fortunately for us, it backfired. In 1917, the Russian revolution came. Many of the players in the farce were killed by the Bolsheviks. The Beilis trial was a eye opener for many. But perhaps for us, we may learn a very important lesson, and that is that anti-Semitism does not exist for no reason. Those who perpetrate hatred of Jews do it for ulterior reasons. Wherever Jews are being accused of something, there is a hidden agenda that utilizes racial hatred to obscure the true rational.